← Say “NO” to soft drinks! Ozark Slow Food’s Fund Your Farmers Tasting also offers a silent auction with incredible opportunities for every fancy: choose from wine, handcrafted oils, jewelry and gifts, to dinner for a group or a private getaway on the Cape and much, much more. Get a gift or treat yourself! Reserve a ticket now for Sunday, July 19th, from 6-8! The cottage has a full kitchen and large living room, 2 bedrooms (one sleeps 2 and one sleeps 3), large deck on east side overlooking a pond, only a 1 minute walk away from the Great Pond. 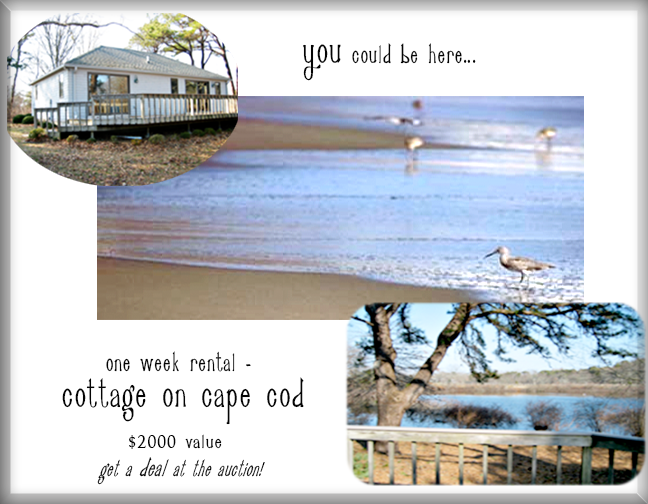 Located right on the Cape Cod Rail bike trail. Enjoy your stay any time after Labor Day 2015. This entry was posted in Events and tagged Event, Fund Your Farmer. Bookmark the permalink.